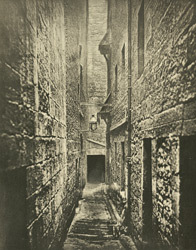 Scottish photographer Thomas Annan's view of poor living conditions in the narrow lanes just off the High Street, Glasgow. Annan was commissioned by The City Improvement Trust to document the city's slums which were scheduled for demolition and reconstruction by an act of Parliament in 1866. In his introduction to 'The Old Closes And Streets Of Glasgow' William Young writes that, "The value of many of the plates embraced in this volume consists in their true presentation or suggestion of the seamy side of the city's life; in their depicting with absolute faithfulness, the gloom and squalor of the slums."